Using the ESO 3.5-m New Technology Telescope and the Very Large Telescope (VLT) , a team of astronomers  have discovered a dusty and opaque disk surrounding a young solar-type star in the outskirts of a dark cloud in the Milky Way. It was found by chance during an unrelated research programme and provides a striking portrait of what our Solar System must have looked like when it was in its early infancy. Because of its striking appearance, the astronomers have nicknamed it the "Flying Saucer." The new object appears to be a perfect example of a very young star with a disk in which planets are forming or will soon form, and located far away from the usual perils of an active star-forming environment . Most other young stars, especially those that are born in dense regions, run a serious risk of having their natal dusty disks destroyed by the blazing radiation of their more massive and hotter siblings in these clusters. The star at the centre of the "Flying Saucer", seems destined to live a long and quiet life at the centre of a planetary system, very much like our own Sun. This contributes to making it a most interesting object for further studies with the VLT and other telescopes. The mass of the observed disk of gas and dust is at least twice that of the planet Jupiter and its radius measures about 45 billion km, or 5 times the size of the orbit of Neptune. Planets form in dust disks around young stars. This is a complex process of which not all stages are yet fully understood but it begins when small dust particles collide and stick to each other. For this reason, observations of such dust disks, in particular those that appear as extended structures (are "resolved"), are very important for our understanding of the formation of solar-type stars and planetary systems from the interstellar medium. However, in most cases the large difference of brightness between the young star and its surrounding material makes it impossible to image directly the circumstellar disk. But when the disk is seen nearly edge-on, the light from the central star will be blocked out by the dust grains in the disk. 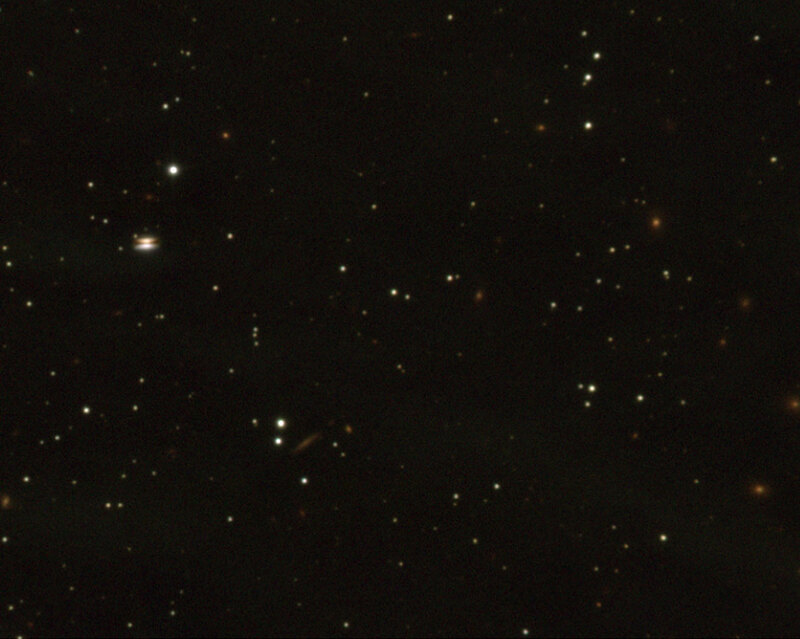 Other grains below and above the disk midplane scatter the stellar light, producing a typical pattern of a dark lane between two reflection nebulae. The first young stellar object (YSO) found to display this typical pattern, HH 30 IRS in the Taurus dark cloud at a distance of about 500 light-years (140 pc), was imaged by the Hubble Space telescope (HST) in 1996. Edge-on disks have since also been observed with ground-based telescopes in the near-infrared region of the spectrum, sometimes by means of adaptive optics techniques or speckle imaging, or under very good sky image quality, with a VLT image of such an object in the Orion Nebula. Last year, a group of astronomers  carried out follow-up observations of new X-ray sources found by the ESA XMM-Newton and NASA Chandra X-ray satellites. They were looking at the periphery of the so-called Rho Ophiuchi dark cloud, one of the nearest star-forming regions at a distance of about 500 light-years (140 pc), obtaining images in near-infrared light with the SOFI multi-mode instrument on the 3.5-m New Technology Telescope (NTT) at the ESO La Silla Observatory(Chile). On one of the NTT photos obtained on April 7, 2001, they discovered by chance a strange object which by closer inspection turned out to be a resolved edge-on circumstellar disk, so far unnoticed and displaying infrared scattered light around a young star. On this photo (ESO Press Photo eso0214a) two characteristic reflection nebulae can barely be seen, flanking a marginally resolved dark dust lane in the East-West direction in front of the star. To confirm this discovery and in order to learn more about the object and the disk, the astronomers obtained additional observations (during "Director's Discretionary Time") with the 8.2-m VLT ANTU telescope. The observations were carried out in "service mode" by ESO staff, using the near-infrared multi-mode Infrared Spectrometer And Array Camera (ISAAC) - the "father" of the SOFI instrument ("Son OF Isaac"). A series of fine images was obtained on August 15, 2001, under very good observing conditions (with "seeing" of 0.4 arcsec). Now the two reflection nebulae are clearly seen (eso0214b), and the dark dust lane is well resolved. The leader of the group, Nicolas Grosso, recalls the first impression when seeing the true shape of the object: "That is when we looked at each other and, with one voice, immediately decided to nickname it the `Flying Saucer'!". Seven young stars in the Rho Ophiuchi star-forming region are known to display similar reflection nebulae surrounding a dark lane (suggesting the presence of a dusty disk), but these objects are all still deeply embedded in the dense cores of this dark cloud. They are mostly protostars with ages of about 100,000 years, surrounded by a remnant infalling envelope. On the other hand, astronomers think that the newly found object has an age of about 1 million years and is in a more evolved stage than those in the neighboring Rho Ophiuchi star-forming region. 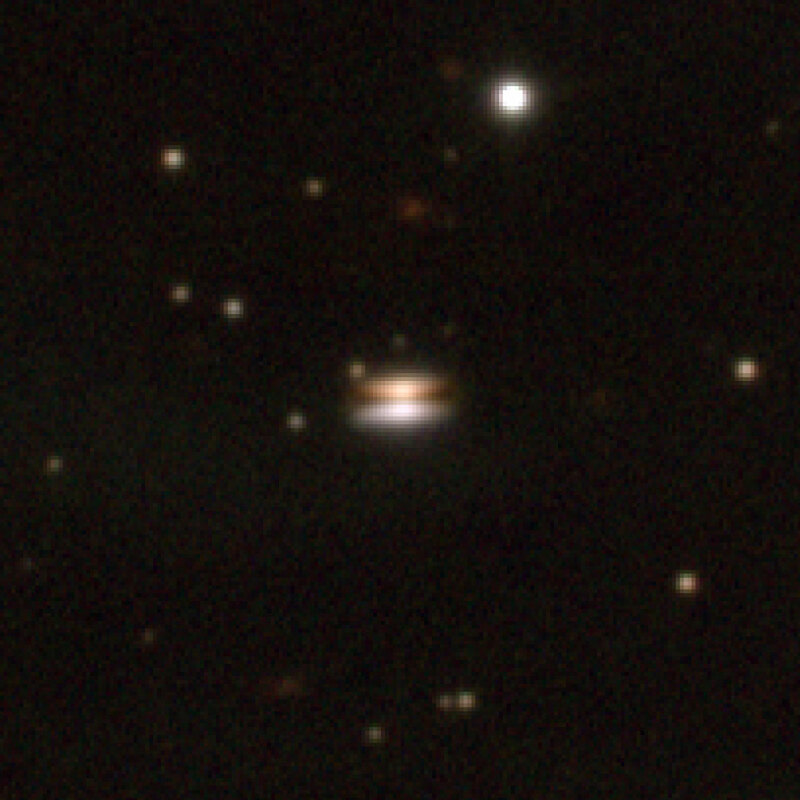 The new disk is located at the periphery of the dark cloud and is much less obscured than the younger objects still embedded in the dense dark cloud nursery, thus allowing a much clearer view of the dust disk. The resolved circumstellar dust disk in the "Flying Saucer" has a radius of about 300 Astronomical Units (45 billion km), or 5 times the size of the orbit of Neptune (assuming the same distance as the Rho Ophiuchi star-forming cloud, 500 light-years). From model calculations, the astronomers find that it is inclined only about 4° to the line of sight and therefore seen very nearly from the side. A lower limit to the total mass of the disk is about twice the mass of planet Jupiter, or 600-700 times the mass of the Earth. A study of the recorded (reflected) light from the optical to the near-infrared indicates that the central young solar-type star has a temperature of about 3000 K and 0.4 times the luminosity of our actual Sun. A detailed analysis of both reflection nebulae shows an unusual excess of infrared light from the upper nebula, both visible in the NTT and VLT images, which cannot be explained by a simple axisymmetrical model. Future complementary high-resolution observations by the VLT adaptive optics camera NAOS-CONICA will help the astronomers to understand the origin of this puzzling phenomenon, and its possible link to the planet-forming mechanism. Said Nicolas Grosso : "The `Flying Saucer' object presents us with a striking portrait of our Solar System in its early infancy. With this object, Nature has provided us a perfect laboratory for the study of both dust and gas in young circumstellar disks, the raw material of planets." As this disk is located at a dark cloud periphery and not embedded in it, follow-up studies at millimetre wavelengths with existing antenna arrays will give a clear view without the complication of unrelated background emission from dark cloud material. These future observations will provide an easy mapping of the gas and dust material around this young solar-type star, and allow a study of the chemical processes at work in this protoplanetary disk. Moreover, current antenna arrays should be able to detect the Keplerian rotation of this disk, providing a direct measurement of the mass of the central star. Computer simulations predict that baby planets produce measurable structural changes in circumstellar disks, however such signs of the planet formation are far from the sensitivity and the spatial resolution of the actual antenna arrays. The detection of these features are the goal of ALMA, and there is no doubt that this "planet nursery" object will be a prime target for this future array of antennas. The team consists of Nicolas Grosso (Max-Planck-Institut für extraterrestrische Physik, Garching, Germany), João Alves (ESO, Garching, Germany), Kenneth Wood (School of Physics & Astronomy, University of St Andrews, Scotland, UK), Ralph Neuhäuser (Max-Planck-Institut für extraterrestrische Physik, Garching, Germany), Thierry Montmerle (Service d'Astrophysique, CEA Saclay,Gif-sur-Yvette, France) and Jon E. Bjorkman (Ritter Observatory, Department of Physics & Astronomy, University of Toledo, Ohio, USA). The results described in this Press Release have been submitted to the European research journal Astronomy & Astrophysics ("The `Flying Saucer': a new edge-on circumstellar dust disk at the periphery of the rho Ophiuchi dark cloud" by N. Grosso and co-authors).